After much feverish activity from both Ian and myself this week, we are pleased to launch a new discussion forum for the three towns area of Llandudno, Colwyn Bay & Conwy. 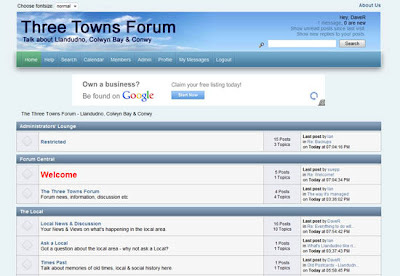 The Three Towns Forum is designed to be a fresh start for discussion forums locally, free of the nonsense and problems that have plagued previous attempts. Why those three towns...? Because most of us in that local area have either lived, worked or socialised in all three of the towns during our lifetime and, so, have an interest in all of them. The Forum was born out of the old Llandudno Local forum but offers an expanded geographic coverage, together with a fresh, new design and added functionality. Everyone; whether local, visitor or just someone with an interest in Llandudno, Colwyn Bay or Conwy is welcome to read the posts and join in with their own thoughts & comments. Signing up as a Member is free and simple - just go to www.threetownsforum.co.uk click on 'Register' at the top of the screen, enter your desired Username, Password, Email Address and your account will be created for you to start posting immediately.